The Destination Imagination program is a fun, hands-on system of learning that fosters students’ creativity, courage, and curiosity through open-ended academic Challenges in the fields of STEM (science, technology, engineering, and mathematics), fine arts and service learning. Our participants learn patience, flexibility, persistence, ethics, respect for others and their ideas, and the collaborative problem solving process. Teams may showcase their solutions at a tournament. We want to empower youth. We seek to nurture skills and courage such that students, instead of waiting for the world to say what they can or should do, fearlessly pursue their passions. The Washington Imagination Network is a state-level affiliate of Destination Imagination, and is responsible for, among other things: the training of volunteers, team managers and officials, the coordination of state and regional tournaments, the maintenance of state-level information resources and the handling of countless administrative and logistical tasks that pop up throughout the year. It is the goal of the Washington Imagination Network to help develop and hone the creative problem-solving skills of Washington's youth in a positive atmosphere. Teams are composed of up to seven members, and students from kindergarten through university level participate. Each team needs an adult Team Manager. Team Managers direct students’ learning but do not directly help the team develop its solution to the DI Challenge. Team Managers are often faculty members or parents. 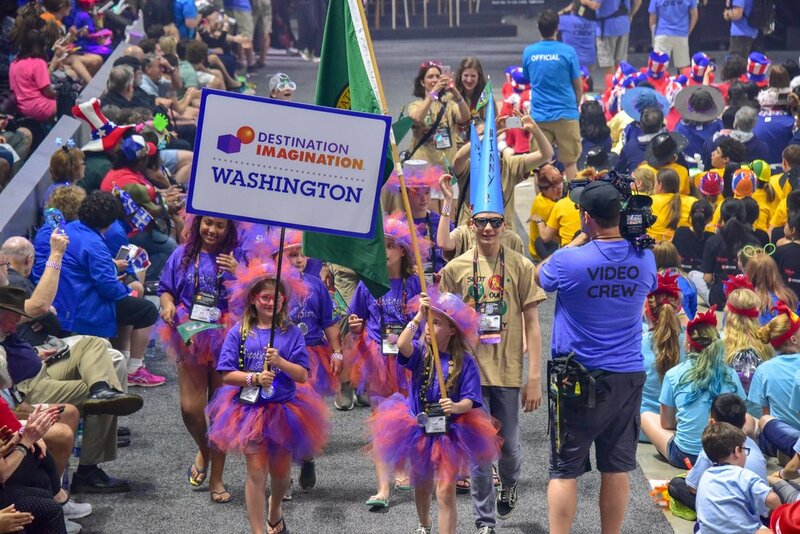 The Washington Imagination Network (WIN) is a non-profit, volunteer-led, cause-driven affiliate of Destination Imagination. We are able to host the tournaments in which teams compete with the help of hundreds of volunteers, including Regional Directors, Tournament Directors, Challenge Masters, and Appraisers. 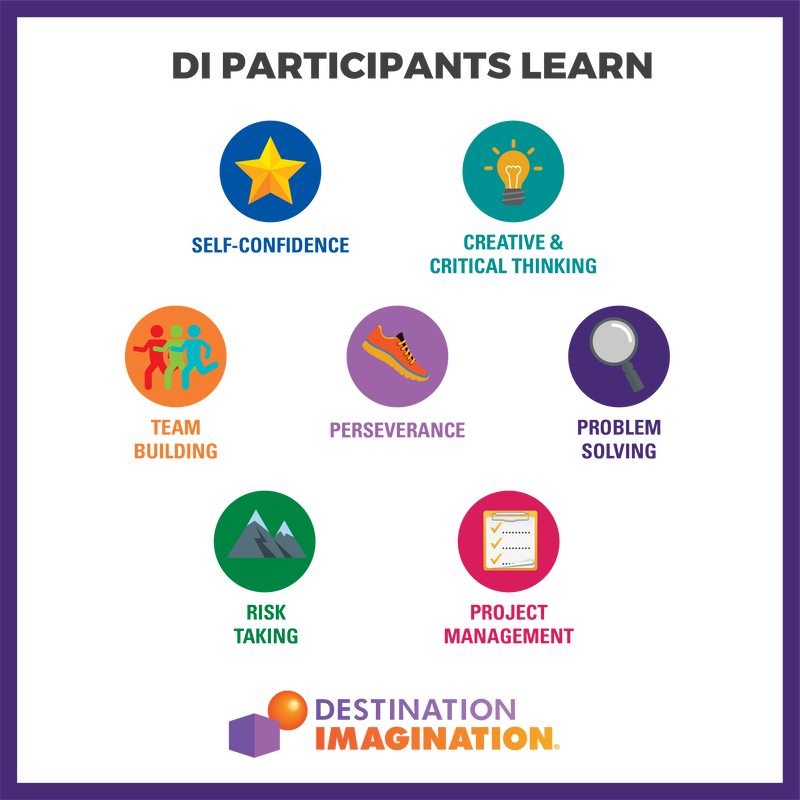 Destination Imagination is a 501c3 with 200,000 participants annually in 32 countries and 48 states; partnered with NASA, USSRC, 3M, Oracle, Disney, Motorola Solutions, and many others. There are six new competitive Challenges to choose from each year. Each of the Challenges is developed by a team of educators and industry experts who target a particular area of the curriculum and its related standards of content and performance. The areas of focus include: Technical, Scientific, Structural, Fine Arts, Improvisational and Service Learning. There is also a non-competitive Early Learning Challenge (called the "Rising Stars") that allows participants - preschool through 2nd grade - to develop social and problem solving skills. Watch a video about the Challenge experience. ​Each season takes place during the school year, culminating with Global Finals in May. Depending on the Challenge, teams typically spend two to four months developing and practicing their Challenge solutions. Registration for teams begins in the late summer or early fall (generally towards the beginning of September). Regional tournaments occur in late February or early March (and generally run from around 8 am - 4 pm). The Affiliate tournament gathers teams from across the State and is often held in late March or early April. DIHQ hosts the Global tournament which will take place the third week of May in Kansas City, MO. Team solutions are assessed at regional, state or national, and global tournaments. Every year, local volunteers help run 200 tournaments around the world. Some schools run DI as an after school program, some school districts incorporate the program into their electives curriculum, and some DI teams are independent. Teams are submerged in a fun, innovative environment to improve their creative thinking, critical thinking, and collaborative problem solving. Our participants learn and experience the creative process, develop new friendships, and learn to work together. The skills and confidence you gain through DI reverberates throughout your entire life. Read about a few DI alumni success stories. ​Teams choose one of the seven Challenges. After creating and developing their solutions, they go to a local tournament. Top-scoring teams advance to their state or country tournament, also known as an Affiliate tournament. The top-tier teams from each Affiliate tournament have the opportunity to participate in Global Finals – the world’s largest celebration of creativity.